After spending one life-changing day in Paris with laid-back Dutch actor Willem De Ruiter, sheltered American good girl Allyson �Lulu� Healey discovered her new lover had disappeared without a trace. Just One Day followed Allyson�s quest to reunite with Willem; Just One Year chronicled the pair�s year apart from Willem�s perspective. Now, back together at last, this delectable e-novella reveals the couple�s final chapter. When you hear the announcement that Gayle Forman is writing something, you immediately put the preorder in because GAYLE FORMAN IS EVERYTHING. But seriously, I found myself head over heels for�Just One Day and�Just One Year�and I will admit that I was happy with how the duology ended. I was actually totally okay with the ending and in my head, I figured yeah, this is totally a happily ever after. However, I think we need to take a minute to be real and to note that even though I like the ending of�Just One Year, there’s not a chance in the world that I wasn’t pumped up for�Just One Night. 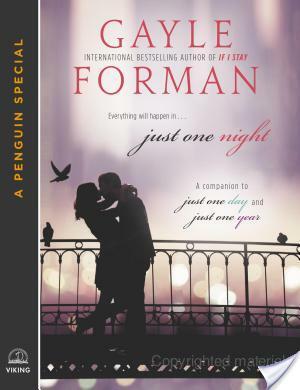 So in sum, I read�Just One Night for just more Willem and Allyson. Really,�Just One Night picks up exactly the moment where�Just One Year ends. Okay, so basically we get to see what happens to Allyson after she reunites with Willem. We get to see what happens to Willem. We get to see more of Dee and pretty much the entire cast of characters. There’s lots of kissing. If you’re someone who is into swooning and happy endings without a ton of drama, you’ll love this. ALSO ADULT MOMENTS HOLLAAAAAAA. Pretty much that’s the story and it’s totally okay with me. Is This Novella Worth Reading? Yes, yes it is if you are of the legion of Gayle Forman fans, if not please go home now. Seriously. Also? The novella is 40 pages and currently $1. Like, there’s zero reason not to read it. PLUS KISSING AND SEXYTIMES AND EUROPE AND CHARACTERS WE KNOW AND LOVE and all the caps in the world on my end, ALL OF THE CAPS. Swoons all the way through, yo. I read If I Stay (just saw the movie trailer last night at The Fault in Our Stars, yeah!) and Where She Went (which I loved even more) but haven’t read this series. Great review! I was happy with the ending of Just One Day and Just One Year like you were, but who is going to say no to more Willem and Allyson? Not me!! I loved how she gave us the follow-up that we all could have imagined and kept it to one night. LOVED IT! And your recap/review! Exactly, none of us would be like, naw, I don’t need anymore Willem and Allyson. You’re right, the way she structured it as one night was perfect. Yes, the alternating perspectives were really well done. I reallllly want to read this series. I saw Gayle at the Teen Author Carnival, but she doesn’t know me at all, so I was afraid to approach her. And that GIF. I need to experience those feels. Great review, April! OH MY GOODNESS READ IT. Also, Gayle is SUPER nice, at least in person at signings. You should say hi to her if you ever go to her signings. Just read it. I loved it. Appropriate gif for sure. Yeah, the story is super sweet. I hope you get a chance to read these books soon.